As garden designers ourselves over 25 years we have found this post of particular interest. For ourselves, we have always favoured, and ultimately designed, formal gardens where a circle, a square, after all, with the corners taken off, was as far as we were prepared to go down the road of informality. However, what you have achieved here is the most splendid of outdoor rooms and where the narrative of the garden relates to, and is linked with, the central tree which, if we understand correctly, became your starting point. 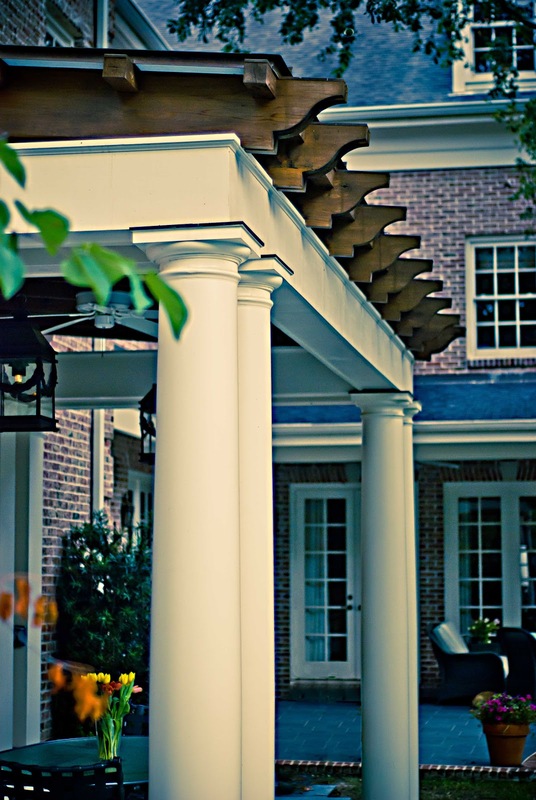 Your use of quality materials enhances the space, as does your treatment of the roof of the loggia which is most attractive and which, of course, relates to the dominant theme. If we were the owners of this garden, then we should be absolutely delighted with the finished result - a lesson in imaginative design, flair and originality meeting practicality. Thank you so much for showing it to us. Thank you very much for your kind words! I really appreciate your comments, especially coming from a practioner of your experience and knowledge. Beautiful photos, Nadia! Your choice of materials really complements the natural beauty of the outdoor space. I especially like the pale blue ceiling -- and the inviting swing. Thanks to your decisions, the entire area is serene and composed. It looks like an ideal place to while away an afternoon. I would not expect anything less from you. This is indeed a fabulous outdoor room. Your attention to detail and your understanding of relating parts to the whole is incredibly poetic and inspiring. beautiful! i find myself wanting to venture from interiors into other areas of design, if not for just 1 project. the blue ceilings also keep wasps from nesting as they think it's sky. clever. It's MAGICAL, Nadia! It's fun to see the finished project - I remember you telling me about it when the project was in the beginning stages. wow. i am stunned. this is gorgeous! so gorgeous! you are sooo talented - what a gift you have. Very very nice Nadia! I admired your work and said to Giorgio would like to do something similar at our home! Love from Italy!